I live in the sort of place where a casual mention of your fondness for rhubarb is likely to land you in somebody’s brother-in-law’s mother’s field with an armload of rhubarb stalks and an abiding gratitude for midwestern neighborliness, which is how I came to have several quarts of diced rhubarb in my freezer. Naturally, I would have preferred the rhubarb to end up in a pie rather than in the freezer, but Chris can conceive of few things more repulsive than cooked fruit and I can’t eat a whole pie by myself. I can, as it turns out, eat quite a lot of hand pies by myself, and I can eat them in the car on the way to work. For breakfast. I’m not sure how the concept of hand pies eluded me for so long or why I never thought to create them myself. I’ve often wished I could bake half a pie and I briefly owned a set of mini pie dishes until I discovered how time-consuming, impractical, and unsatisfying individual pies can be, but it never occurred to me that one could make pie without a pie dish. And despite the fact that all the culinary cool kids have been at this hand pie thing for years, it wasn’t until I saw bourbon peach hand pies on Smitten Kitchen that I learned of them. Thank goodness I did. Hand pies are as delicious as they are brilliant, even when a quarter of the filling oozes out as they bake. They can be packed in a lunch, given in reciprocity to neighbors, or piled on a platter to feed hungry friends at a party. Best of all, the hand pies can be frozen and then removed one by one from the freezer as the craving strikes, not to mention their potential as breakfast food. I’m not gonna lie: these aren’t the least complicated thing you could make, but that’s really no reason not to try them. There are several points at which hand pies could go terribly, terribly wrong but if you A) use a nice, sturdy dough and B) don’t overstuff them — a task made simpler if you C) chop your filling into teensy tiny pieces, everything will be just fine. Click over to Deb’s recipe for bourbon peach hand pies on Smitten Kitchen and do everything she says. Sure you could use whatever pie crust recipe you usually use or — shudder to think — that store-bought crap, but I don’t recommend it. Your standard pie crust is likely to crack, and the store-bought crap is likely to taste like crap (in addition to cracking). Plus, as fussy as this particular pastry recipe may seem, I found it to be quite a nice little weekend project — all that chilling leaves plenty of time for cleaning the bathroom or swilling wine on the deck, whichever you prefer. Also it’s the best damn pastry you’ll ever taste. 1) Make the pastry according to the directions on Smitten Kitchen. I recommend using some sort of 6″ cutter for the dough. I used an inverted glass bowl about 5″ in diameter and thought it was just a bit too small to work with. 2) Preheat your oven to 375 degrees and line a large baking sheet (or two) with parchment paper. 3) In a large bowl, toss together the filling ingredients, then mound about 2 T. of filling onto half of each chilled dough round. 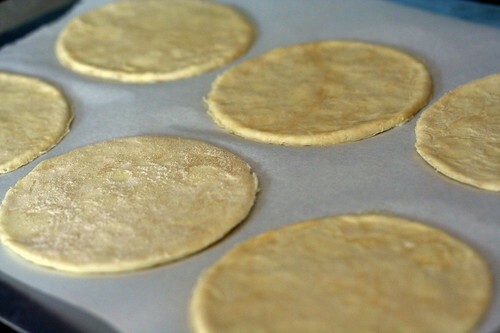 Moisten the edges of the dough rounds with water (I tend to do this by dipping a finger in water, but most people use a brush), fold the circles in half over the filling, and crimp closed with the back of a fork. Place on parchment-lined baking sheet(s) and refrigerate for 30 minutes. 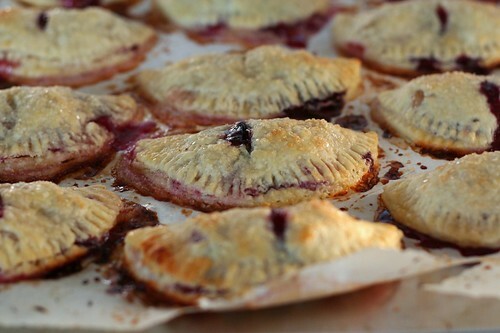 4) Remove from refrigerator and use a sharp knife to cut a small slit in each hand pie. Brush each pie with milk and sprinkle with plenty of coarse sugar. Bake until golden brown, about 20-25 minutes. *To string rhubarb, grasp the stalk between your thumb and a paring knife (or vegetable peeler) and pull the strings down the length of the stalk. This entry was posted on October 5, 2008 by Megan @ When Harry Met Salad. 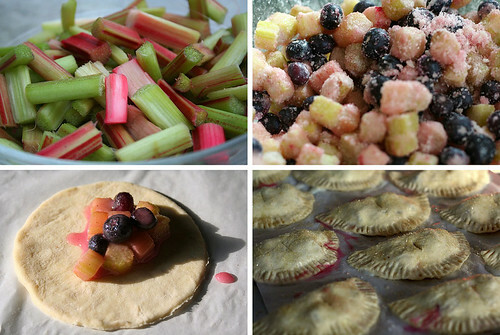 It was filed under baked goods and was tagged with blueberries, hand pies, pie, rhubarb. 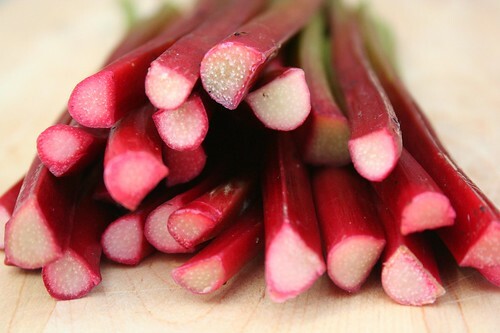 Those look yummy, even though I am not a rhubarb fan. I made cheese danishes this weekend, and wanted to photograph the process ala When Harry Met Salad, however I was out of batteries for my camera. They were really flippin’ impressive though. regarding pastry and overfilling to remember too before starting. Thanks for sharing this. Those look mega-yummy! And no, I’m not the Elizabeth who just posted before this comment. I still just can’t get into rhubarb. Hey, so I wanted to tell you that I made brussel sprouts for Spooney this weekend, because he loves them. I had been thinking for a while that there must me something I could do to brighten them up a little bit. So I sauteed the sprouts in butter, garlic, and white wine. Seasoned with some soy bacon. Chopped up some green tomatoes, breaded them with corn meal, salt & pepper and sauteed them in butter too and them combined them with the sprouts. For me, the perfect bitter/sour/salty combo. Yum. Just discovered your blog–gorgeous photos! Looks yummy Meg, but then I become bitter and realize I cannot go over and visit and eat all this wonderful food you are making! Hope all is well. Great blog Megan. Feel free to bring an extra hand pie to work next time;) I love the books you have posted as well, I’m off to write another complaint to Indiebound!